Now the release date for Star Wars: The Old Republic has been announced (best Christmas present ever! 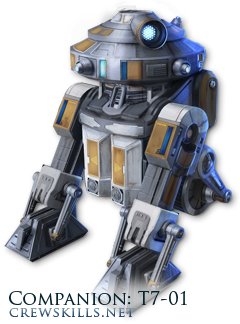 ), I know a lot of people are looking for more information on SWTOR’s mechanics and fundamental game systems. Whether you’re coming fresh to the game or you’re an MMO veteran, there will be something of a learning curve involved as SWTOR’s crafting system has quite a few unique features. So, let’s look at how the system works! Those of you familiar with BioWare’s single-player MMOs will recall an array of memorable ‘companion’ NPCs who’d join you on your adventures. Bioware’s carrying this concept forwards into SWTOR, giving each class five unique NPCs who’ll join up with your character as a friend, apprentice, assistant, quest hook… and crafting minion. (And for those of you who are worried about a horde of identical NPCs running around if everyone uses the most popular companions, fear not – you’ll be able to customise your companions’ looks and behaviour. Crew Skills – and now you see where my blog title comes from! – are BioWare’s take on tradeskills, crafting skills, professions, whatever you want to call them. Your character learns their crew skills, and your companions actually perform the skills for you. Crew Skills are divided into three types: Gathering Skills (collecting raw materials), Crafting Skills (turning raw materials into useful items), and Mission Skills (performing ‘activities’ that give you gear and other rewards). You can have a total of three Crew Skills, only one of which can be a Crafting skill (although it doesn’t have to be). Without knowing the ins and outs of the system it’s hard to judge why that limitation exists; I suspect it’s to make sure crafters interact by making them interdependent. As you’ll see in the list below, Gathering Skills and Crafting Skills are tightly tied, and Crafting Skills are also separated by whether their products are useful to Force users or non-Force users. Mission skills are another, very interesting, kettle of fish. These skills can be performed by the player character or their active companion while adventuring out in the world; there are also reports that you can send a companion out to gather resources independently of what your own character is doing. Scavenging – this involves “recovering useful materials and parts from old or damaged technology”. It provides raw materials for crafting skills that make armor, weapons and mods for non-Force users. Archaeology – this involves acquiring “imbued items like lightsaber crystals and ancient artifacts”. It’s the Force equivalent of Scavenging, providing raw materials for crafting skills that make armor, weapons and mods for Force users. Bioanalysis – this allows your companion to collect “genetic material from creatures and plants”. It’s used for making serums and biological implants. Slicing – this skill lets your companion hack into computers and other electronic devices to retrieve data and crafting schematics. I’ve heard that it also provides components for making droids, but I don’t have confirmation of that. These are the classic MMO tradeskills where you turn raw materials into a useful item – armor, weapons, or other gear, depending on which skill you select. They’re performed by your companions back on your ship, and can be completed by the companion while you’re offline. Unlike the “10 second progress bar” of crafting in games like WoW and RIFT, crafting a single SWTOR item may take considerably longer – from five minutes to 24 hours, according to lead writer Daniel Erickson. To mitigate that somewhat, you can (as far as I know) have more than one companion crafting items simultaneously, provided they’re not busy with another mission or accompanying you. Armormech constructs armor mods for non-Force users. This uses raw materials from Scavenging. Armstech constructs weapons & weapon mods for non-Force users. This uses raw materials from Scavenging. Synthweaving makes armor for Force users. This uses raw materials from Archaeology. Biochem makes “performance-enhancing serums and biochemical implants” – in other words, consumable boosts, and possibly permanent items as well (depending on just what the implants are). Unsurprisingly, Biochem uses raw materials from Bioanalysis. Cybertech makes “gadgets and components for Droids”, as well as armor mods for non-Force-user armor. It uses raw materials from Scavenging and, I believe, also from Slicing. These are one of the unique parts of the SWTOR tradeskills system. If you take a Mission Skill as one of your three Crew Skills, you can send one of your companions off to another location in the galaxy to carry out a mission for you. These missions cost credits, but can apparently reap big rewards. Mostly the missions are drawn from a pool of randomly-generated choices, but apparently sometimes your actions can unlock special/rare missions with big rewards. Rumour has it that Slicing can also open up special missions. There’s very little info out there about what Mission Skills actually do; what info I have comes from unconfirmed sources (though not beta leaks, as far as I know), and I’m not sure if it’s accurate or not. So take all these with a generous grain of salt. Diplomacy can provide rare materials for light-weight armor and can affect your Light & Dark Side points for morality alignment. Investigation can provide rare materials for medium-weight armor, as well as schematics for all Crafting Skills. Treasure Hunting can provide rare materials for weapons (for both Armstech and Artifice), and for Cybertech. Underworld Trading can provide rare materials for heavy armor, as well as for Biochem and Cybertech crafting. This overview has barely touched on the intricacies of the system yet – many of the mechanics have yet to be revealed, and the devs keep hinting that the overall tradeskill system will be complex and very rewarding for dedicated crafters (which is just what I like to hear!). Obviously, there’s a lot more info to come, and I’ll focus on specific areas of what we do know in future posts. For now, if you’re making plans about what to play in SWTOR, it’s definitely worth thinking about what Crew Skills interest you. The system obviously lends itself to a setup of 1 Gathering Skill + 1 Crafting Skill + 1 Mission Skill. Each Crafting Skill seems to pair nicely with a Gathering Skill and a Mission Skill. For instance, if you’re a Trooper you might want to take Armstech as a Crafting Skill with which to make your big guns, with Scavenging to provide raw materials and Treasure Hunting to provide rare components. On the other hand, I can see the appeal of eschewing pure Crafting Skills, and taking, say, Slicing and two Mission Skills. And, of course, there will inevitably be lots of people who aren’t interested in Crafting Skills, who take three Gathering Skills and sell their haul for profit. How about you? Anyone dead set on a given batch of Crew Skills yet? Do you know something I don’t? Sell me on your choices! Well I plan to play a Bounty Hunter and an Imperial Agent and I mostly want to be able to create armor mods. That’s why I’m going Scavenging + Cybertech + Slicing for my IA and Scavenging + Armormech + Underworld Trading for my BH. You can get a few more details on crew skills here: http://www.starwarsmmolevelingguide.com/crafting-guide/. For profits, I don’t think you need 3 gathering skills at all: slicing gives plenty of credits, at least for now. Crafting skills are kind of useful and sometimes too good to pass on, especially for someone like you who really enjoys crafting. Without the restriction, I probably would have gone 3 crafting skills. I had assumed that Missioning was for the non-crafting players and so I should go dual gathering + crafting. Now after reading this I guess the balanced 1-1-1 may be best. I also am not sure about how much your class affects and effects your crafting – e.g. are there BoP or crafter-bound items. E.g., if Synthweaving were much more profitable, my BH could find it better to be Synthweaving, sell the products and buy the items I need. If I want to be a crafter, then the most profitable profession may not be the profession that is the most use to me. Or is crafting it myself the most practical way to get near eng-game gear? I’m not sure about BoP items; they haven’t officially announced that level of detail yet, and information from the beta is still rather patchy. I do know, though, that crafted gear will be competitive with endgame gear – comments from the devs have varied, but the consensus appears to be either “Best-in-slot for some items will be crafted”, or “raids & pvp will give the top level of gear and crafting will provide the level below it”. I suspect itemisation balance is something they’re still tweaking, but they’ve repeatedly said that they want crafted gear to be useful and relevant at endgame.